As one of the most historic venues in Toronto and certainly the one with the longest history on the waterfront is Palais Royale. As such it has much to boast about in it's hosting of weddings and one of the best things about the venue is it's outdoor lake front wedding ceremony site. 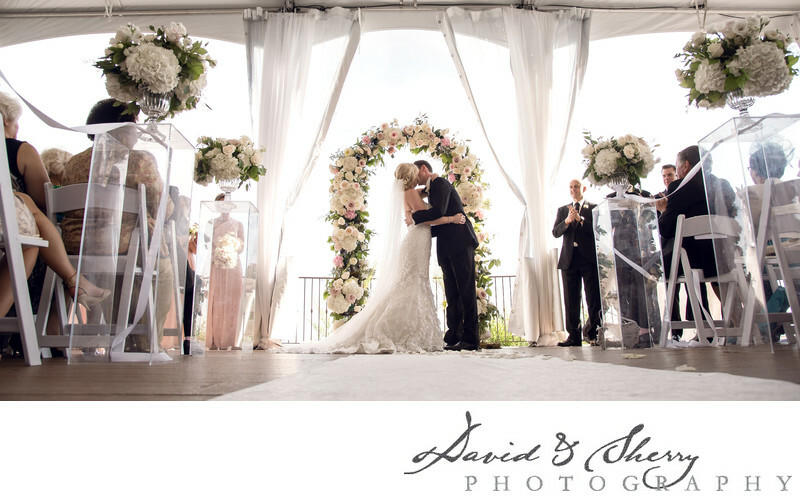 The balcony of the event space is the perfect spot to get married in Toronto and offers the most beautiful backdrop for those who love the Great Lakes. Lake Ontario fills the background and nothing else as the bride and groom say I do in front of their closest family and friends. The balcony is spacious enough to hold all of your guests and within moments after the ceremony it is transformed into the cocktail hour so your friends can enjoy their beverages in the same beauty while you go get your pictures taken. The large white tent provides protection both from the summer sun and the never present rain which may come and dampen the party which makes this an excellent option for weddings from late April through to the end of October. Off to the right is a view of the city skyline of Mississauga and straight ahead is just beauty. Palais Royale is located on the Toronto waterfront.